A conventional dramatisation of Trollope’s familiar potpourri of class, money, love and duty was never going to cut it at Park Theatre. 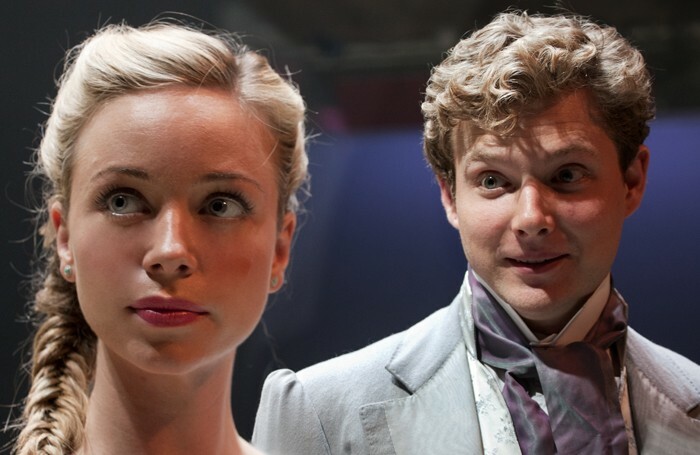 Commendably, the Trollope Society, commissioning Craig Baxter’s play, has backed a vision in which Brechtian techniques are fused with Victorian mores. On a pale set circumscribed and littered with hefty tomes – representative of Trollope’s prodigious output and on which characters stand to denote status – the cast gathers to discuss plot and format. Scenes from the novel are rapidly interspersed with those of the novelist at work on-board a steamship to Australia, a dissection of the literary process. The signature mood is one of radical enquiry, individuals stepping Brecht-like out of character. The humour is knowing, playing with stagecraft and melodrama, a flat-footed Little Britain-style cross dresser among the crinolines. Actors play several roles each, the addition of an apron or wig or an alteration in accent increasingly blatant, the audience conniving. The transparency comes at a cost, with many characters appearing mere ciphers. Tim Frances, though, is an empathetic Trollope, Caroline Langrishe is gloriously sensationalist, while Antonia Kinlay as Lady Anna grows in conviction. It is her low-born suitor, tailor Daniel, who is the moral heart of the play: Will Rastall plays him with quiet but fiery authority.